The Spirit Esprit EL-455 elliptical offers a 20" stride length, a quiet magnetic brake system, and a hefty flywheel for friction-free gliding. The large blue backlit LCD display shows time, speed, calories, program, rpm, level, distance, watts, and pulse. The program selections include 5 pre-set, 2 interactive heart rate, 2 customized users, and manual. 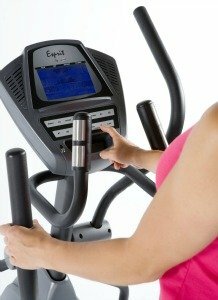 User reviews have been positive on the Spirit Esprit EL-455 elliptical since most any size user from 5'2" to 6'6" finds it to be comfortable with a good stride length. This model has a number of key mechanical specs that you want in an affordable model, such as a heavy (197-pound) steel frame, a roomy 20" stride length, forward and reverse motion on the pedals, a 30-lb steel flywheel, and sealed commercial bearings and premium bushings in all pivot points. Other features of the Spirit Esprit EL-455 to note include 20 levels of resistance on the electronically controlled magnetic brake system, cushioned pedals with three adjustable angle positions, contact grip sensors on the stationary handlebars, a set of moving handlebars for upper body workout, an MP3 audio jack, console speakers, water bottle holder, and front transport wheels. Spirit, which makes Esprit machines as their budget line, is a brand of Dyaco International, the fitness conglomerate which also owns Sole Fitness. The Spirit ellipticals start at around $1,599 retail while the Esprits are more affordable at almost one-third less. Sole machines have a wider price range so you tend to get better value in their lower priced trainers. When you compare the specs of an Esprit with a Sole E25 or E35 model, and the warranties, you will likely pick the Sole machine as the better deal. 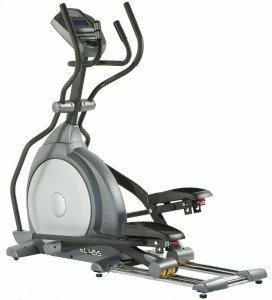 Still, if you find the Spirit Esprit EL-455 elliptical at Costco for $899 or less, it is a really good deal for you. It’s a well-built model that will help you get and stay in shape for years to come. But if it is $999 or more, go with a Sole.